Death has always been described as an inevitable, merciless and wicked fighter but never did we expected it to be this far wicked with Ebony, looking at the circumstances with which it snatched her away from us. 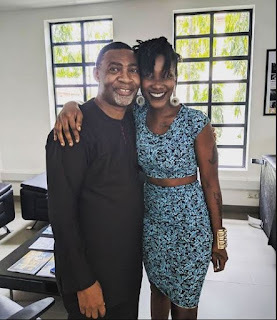 Ebony’s last picture shared on Social media was with the revered Lawrence Tetteh, a modest man of God who is well known in Ghana and it’s had us querying, what their conversation could have been about? Well, Renowned pastor, Dr Lawrence Tetteh, has finally spoken about the death of popular Dancehall artist, Ebony Reigns revealing that he had preached Christ to her just a few days ago before her death. Speaking on the Super Morning Show on Joy FM, Dr Lawrence Tetteh revealed that Ebony was a young woman who loved the Lord. “This is a shock, very sad and disheartening. She was with me in Hungary when I was asked a young lady wanted to meet me. She wanted me to pray with her. When she was so excited to meet the man of God, it was so shocking. I advised her to dress well when she goes to Hungary,” Lawrence Tetteh revealed. When asked if he had led her to accept Christ as her Lord and personal saviour, Lawrence Tetteh stated that ” Her love for Jesus is undying” and he relates to her as “his only daughter”. Ebony including her friend and bodyguard died when the jeep they were travelling with collided with a VIP Bus on the Sunyani road.